Higher education leaders from across the country are grappling with urgent issues facing today’s universities, including diversity and inclusion on campus, how STEM and humanities disciplines are valued, and funding for higher ed. To address some of these challenges, The New York Times hosted a Higher Ed Leaders Forum this week in New York City, bringing together the nation’s most influential leaders in higher education. President Freeman Hrabowski represented UMBC at the event and participated in a conversation on “The Emotional Challenges of Leadership Today.” He joined Marc Brackett, director of the Yale Center for Emotional Intelligence, and Adam Bryant, deputy science editor and Corner Office columnist for The New York Times, to discuss how complex social change is creating new demands for education leaders and the emotional challenges that presidents, provosts, and chancellors are confronted with in today’s education environment. Dr. Hrabowski emphasized the importance of helping students meet high expectations through building community and creating a culture of support on today’s college campuses. He added that it takes the full university community to reach goals focusing on success. In a separate essay published in The New York Times, Pres. 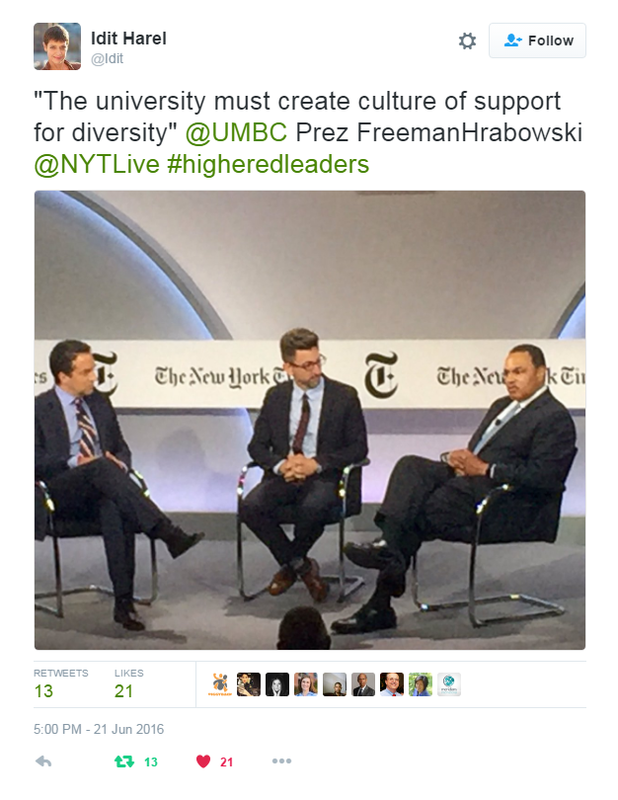 Hrabowski wrote about the value of caring communities where people view success as a collective responsibility. Ensuring that more students succeed will require a host of strategies, from better understanding our students’ strengths and challenges to supporting teacher and faculty development. Any solution must start with this mind-set — we must agree that it is not acceptable for such a large number of students to work hard to earn a college education, often going into debt, not to succeed. As a society, we must be willing to look in the mirror, and we need to listen to students and their families as we craft strategies. Image: Pres. Hrabowski speaks with students in the UMBC Commons during visit with leaders from Simmons College. Photo by Marlayna Demond ’11.